The newest specification for PCI-based industrial computers is called CompactPCI. It is electrically a superset of desktop PCI with a different physical form factor. CompactPCI utilizes the Eurocard form factor popularized by the VME bus. At the heart of CompactPCI is a gas tight, high density pin-and-socket connector which meets the IEC-1076 international standard. Its low inductance and controlled impedance make it ideal for PCI signaling. This 2 millimeter "Hard Metric" connector has 47 rows of 5 pins per row, with a total of 220 pins (15 pins are lost to the keying area). An additional external metal shield is also used. The large number of ground pins ensures adequate shielding and grounding for low ground bounce and reliable operation in noisy environments. This connector's controlled impedance minimizes unwanted signal reflections and enables CompactPCI systems to have eight slots, as compared to the desktop PC's four. This can easily be expanded with PCI bridge chips, available from a number of manufacturers. Staged power and ground pins are specified for future hot swap capability. 3U CompactPCI processor boards use a single 220 pin connector for all power, ground, and all 32 and 64 bit PCI signals. This connector consists of two halves - the lower half (110 pins) is called J1 and the upper half (also 110 pins) is called J2.. Twenty pins are reserved for future use. Backplanes use male (pin) connectors and plug-in boards use female (socket) connectors. Plug in boards that only perform 32 bit transfers can use a single 110 pin connector (J1). 32 bit boards and 64 bit boards can be intermixed and plugged into a single 64 bit backplane. 6U boards can have up to three additional connectors with a total of 315 pins. These are also 2mm style. These optional connectors can be used for a variety of purposes. 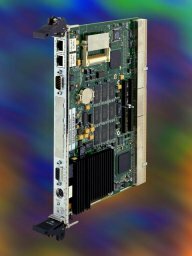 They can be used as a bridge to other buses like VME or ISA in hybrid backplanes These hybrid backplanes use CompactPCI for the processor and high speed peripheral section and one of these industrial buses for an I/O expansion section. PICMG is developing "recommended practices" with defined pinouts for bridging to VME-64 and telephony buses like SCSA and HMVIP. These connectors, in conjunction with commercially available PCI-PCI bridge chips, can also be used to extend the CompactPCI bus in 8 slot increments.. In this manner a CompactPCI system with 16, 24 or even 32 slots can easily be fabricated. The connectors can also be used for rear panel I/O in a manner similar to VME. This approach, popular in the telecommunications industry, brings I/O wiring out the rear of the chassis. Eliminating front panel wiring can reduce the time required to replace a module in critical applications. The IEEE 1101.11 draft standard for rear panel I/O provides a standard method for doing this, and works well with CompactPCI. For more information, visit PICMG's web site .